The government is making use of the fuel formula to increase the prices of fuel says the General Secretary of the JVP Tilvin Silva. He said this at a meeting held at Morakatiya held as a part of the ‘Ten Thousand Meetings’ programme of the JVP held throughout the country under the theme “People’s Administration to Develop & Protect Country.” The series of meetings are held to apprise the people regarding the programme to build the country being compiled by teams of experts, intellectuals, professionals and progressives and would be presented to the people in January next year. Speaking further Mr Tilvin Silva said the loans obtained to settle the debt the country has been pushed to by previous administrators as well as the present rulers are being used for uncompleted projects driving the country further towards an economic abyss. Sri Lankan voters should have the patience and foresight to vote the best-suited and most-qualified persons into public office and then have the patience as positive social and economic change will not be achieved overnight says Kumar Sangakkara. 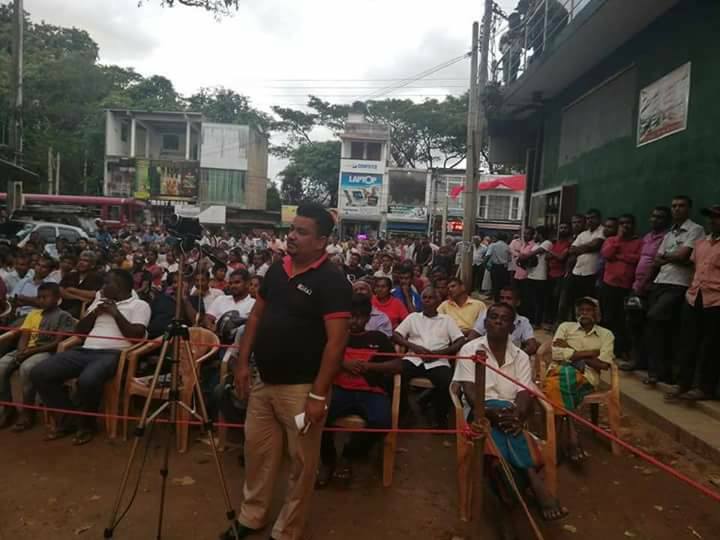 Mr Dissanayaka said the country could be built only if the present political system is changed and emphasized that no party that has ruled the country has taken the necessary steps to build the country. He said a proper programme is necessary to build the country and added that the first scientifically selected cabinet will be established under the government that will be formed by the force made up of intellectuals, scholars and professionals. Speaking further the Leader of the JVP said, “The development of a country doesn’t mean spreading concrete jungles. The people should have a higher living pattern, be healthy and lead contented lives. Today, nobody trusts government schools. Children are sent to school without an aim. There is no proper health service. The education of a child is determined according to the economic strength of the family. The ministers brag but there is no programme to educate the masses about proper health habits. There is no community health service. Sixty million people have received treatment from government hospitals in 2017. This number goes up every year. There hasn’t been a disease prevention programme for the last 70 years. 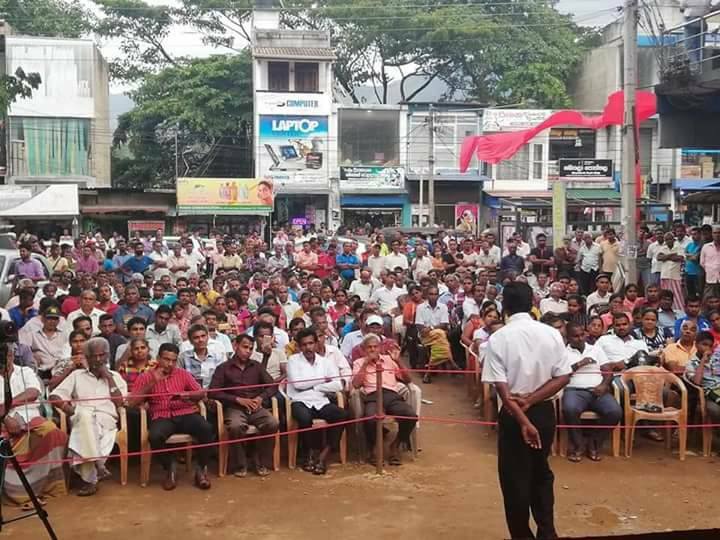 The JVP has taken the initiative to compile national policies for health, education, sports, economy, culture and several other sectors to be implemented under a people’s government formed by forces that rally with us. For this, we have formed Compilation committees consisting of the most efficient and experienced scholars, intellectuals, professionals, progressive citizens. The policies compiled by these committees would be presented to the country in January 2019. Hand over the country to the JVP. We would hand over the administration of the country to the skilful and knowledgeable. Politicians are unable to do it. The experts and the skilful in particular subjects would be asked to carry out development in sectors they have specialized in. At the moment scholars, intellectuals, professionals and progressives are rallying with the JVP and are making great sacrifices. Ranil Wickremesinghe says the country would be developed in 2050. We know how Ranil develops a country. Ranil is now 69 years old. In 2050 he will be 101 years old. Ranil has given the ministerial portfolios for those who should be in homes for the aged. John Amaratunga, Jayawickrema Perera, John Seneviratna should be given an allowance of merit and sent home. There are plenty of skilled people who could carry out the duties of ministers. Ranil has given these old people ministerial portfolios stating they are seniors. The most profitable business in Sri Lanka is politics. It is due to this, people in the two so-called main political parties as well as those from ‘name board’ parties jump from one party to another and try to be on the sided of the ruling party. None from the JVP has made politics a business. Most of the leaders of the party are graduates. All the people’s representatives are graduates, talented and have had higher education. Representatives from other parties as soon as they get elected try to increase their salaries, allowances. Mahinda Rajapaksa has admitted that there were rogues with him. We would like to know who those rogues are. Can he name at least one rogue who had been with him?